Hi All, Amy and I arrived in Kenya early on Saturday morning after a pretty speedy set of flights from London to Mombasa. When we arrive in Mtwapa our first job is always to have a catch up with Rieder (Milele's sponsorship coordinator). We obviously try our best to keep in touch when in England via WhatApp, email and phone calls but nothing is quite as good as a chat over a cup of tea for really understanding what is going on. Our next (and very fun) job is to visit some of the children at home and distribute the packages and letters sponsors had sent. Throughout the course of the day we managed to see Amina, Issac, Riziki, Saidi, Steven, Edward, Emmanuel and Josephine. Phew! Amina and her family are doing well, when we got to their home her family were busy preparing and cooking prices of fish to be sold that morning. Amina herself seemed to be very happy out playing with her younger siblings and cousins and she is (as always) doing very well in school. We also visited Isaac and his family. He is growing by the day and has thoroughly enjoyed his first year at Mtwapa Elite. He will be graduating the kindergarten this year and we are all absolutely thrilled with him. His success is not least attributable to his incredible mother, who takes him to school every day, communicates really well with the teachers and supports him in learning in every way. She manages to shower both her children with love and unconditional support as well as working incredibly hard to make money from her three home-grown businesses! While visiting Isaac we gave out some little dinosaur toys and Isaac loved playing with them with his little brother Anthony. Our co-ordinator Rieder saw a moment to get an insight into their minds and started playing with them, asking Isaac to choose a character for each member of his family. He loved the game, choosing dinosaurs for himself and Anthony and then a figure of some palm trees to represent his mother. When Rieder asked him why the the palm trees, he was quick to reply "because they're beautiful!" The next family we visited was Riziki. When Riziki started in KG2 last year the teachers were unsure if she would be able to progress into KG3 as, given the fact that she had never before attended school, her grasp of written and spoken English was understandably poor. One of her teachers offered to provide some extra tuition and with this help she was not only able to progress into KG3 but she is now, quite literally, top of the class! We also gave Riziki a letter and gift from one of her new sponsors (Paula, Lucas and Imi). The parcel was filled with lovely, thoughtful things which Riziki loved, Amy spent some time showing Riziki what the new and exciting things were but being a clever little girl Riziki needed very little help working everything out! After seeing Riziki's family, we took a short walk across to Saidi's place. He is growing taller by the minute it seems and is doing really well at school. 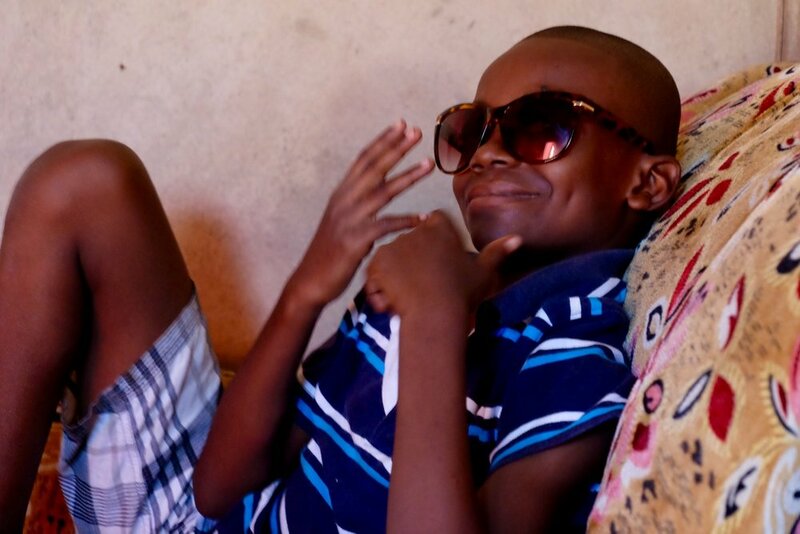 He has now settled into life in Standard 1 at Mtwapa Elite after graduating kindergarten last year. When giving him his letter and gifts from his sponsors, we were really impressed by how much his reading has come along - he read the letter aloud to us confidently (although he needed a bit of help with the word 'Dorchester'!) Thanks to Janet, Tim and Jason for their lovely gift and letter. Next on the list was Steven, who lives next door to Saidi. Still the best of friends, they graduated together into Standard 1 this year. Steven has also settled in well and his teacher is pleased with how he is doing in school. He loved his pen-torch and postcards from his sponsor Angela, it was a really nice way of showing Steven where she comes from - although Rieder did clarify that Angela didn't live in the castle herself! Next was Edward's family. He is cheeky and lively as ever! Edward is wonderfully full of energy - everything is so exciting to him. This has been slightly challenging in the classroom environment in recent years. However, since moving up into the next class he appears to have managed to settle down a little and contain himself. His mum is very involved with his learning and education, always communicating with his teachers about his progress. She was proud to show us his school record file and tell us how well he is doing now he is a 'big boy' in Standard 4. Edward was keen to tell us about how he learned about money in maths - demonstrating his skill in calculating change! His twin baby siblings, Edith and Elliot, are due to start kindergarten themselves in January - regular readers will remember them coming along and be astonished to hear how big they are now! Within 10 minutes of entering the house, Edward was modelling Amy's sunglasses! From Edward we went to see Emmanuel. Emmanuel was one of our first sponsored children and I think many of us still see him as that slightly nervous, giggly six-year old. No more. Now Emmanuel is a polite young man of sixteen and is preparing to sit his final primary examinations, the KCPEs, in just a few short weeks. We can't overstate how proud we are of Emmanuel - he is so studious and dedicated to his work but still finds time to care for the younger children in the children's home. Emmanuel has a high target for the KCPEs and judging by his recent performance it is not unlikely that he could make it. We wish him all the luck in the world. He is excited to finish his exams and have some well deserved time off in December when he can visit his family in Takaungu. 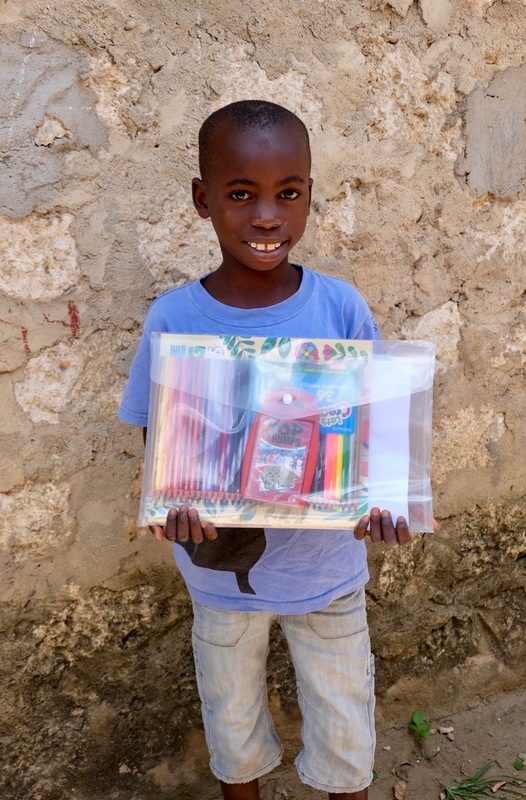 We have no doubt he will be demonstrating his newly acquired football skills - thanks to his gift from sponsor David. Last but by no means least was Josephine, who welcomed us to her beautiful new home which she shares with her two cousins. She is currently halfway through a course at Mombasa College in Secretarial Studies and is developing her skills in filing, computers and administration. Josephine's home looks exactly as you would imagine for a chic young adult - modern patterned rug and reality TV on in the background! 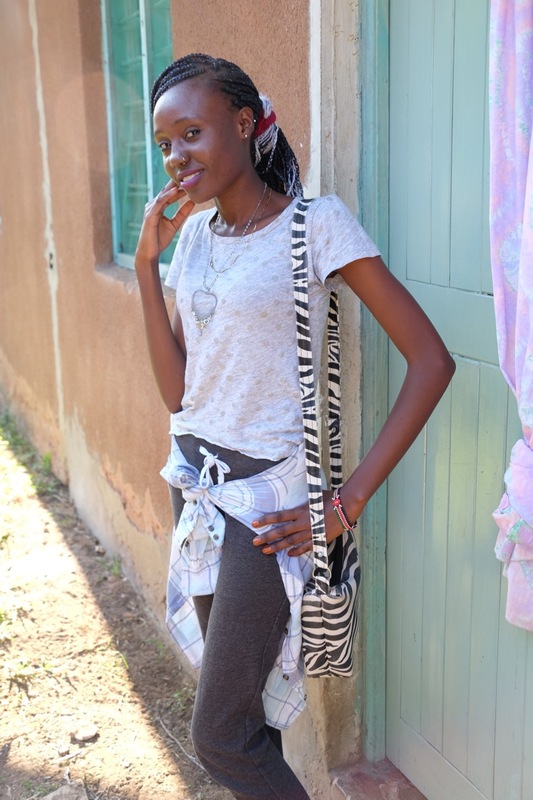 Josephine has always been a fashionista and enjoyed posing for her photo with her new necklace from sponsor Michelle. When we asked her what her expression was, she replied, 'It's Style'. Josephine - I can't keep a straight face!